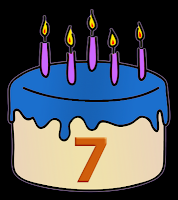 Dearest Bloggy, despite my continual neglect, is seven years old today. Per tradition, the annual bloggy cake has been baked and is now present for all to enjoy. Today's been a somewhat eventful day, I guess. A Monday this year, Bloggy's seventh birthday started out with the geekiness that was the UNIX timestamp hitting 1337000000 seconds since the epoch this morning at 08:53:20 EDT. Then I went to work (which is another something I haven't really mentioned here (I should update this more often (so says he again, yet he never does (should I close all these parentheses now?)))) and attended the first day of my summer classes, before heading home. Meanwhile, my cousin Laurel (if it even makes sense to refer to her with that link anymore) spent all day driving to Chicago where she starts her new job tomorrow after having graduated from Michigan State University back on 5 May. Pretty cool! I really don't have much of an excuse anymore. I recently rejiggered my schedule specifically to allow myself more opportunities for non-directly-school-related things, since that is a large part of how I stay sane. But for now, instead, you have to put up with this tripe which I put off to the last possible minute (literally) and hastily "finish" before midnight.